Sioma Ngwezi lies in the midst of the KAZA transfrontier conservation area: the largest gazetted protected area in the world. This is a Zambian safari destination with serious potential for the future, but Sioma’s recovery has been thwarted by rampant ivory poaching and problems associated with illegal timber extraction. The Peace Parks Foundation is investing heavily in park infrastructure, but to date their presence has failed to turn the tide on poaching and community encroachment. Despite these ongoing challenges and being ravaged by decades of war, there is still a surprising amount of skittish wildlife surviving in Sioma Ngwezi. The list of species we saw during the course of our two recces was impressive: elephant, eland, sable and giraffe as well as cheetah and wild dog. But don’t let this mislead you, wildlife sightings are erratic and the animals shy. Signs of human impact remain widespread and we stumbled upon a disturbing number of elephant carcasses during our last visit. But don’t let this put you off visiting, the park needs tourists in order to survive and Sioma offers somewhere for safari stalwarts who want to experience real Africa rather than see the Big Five. 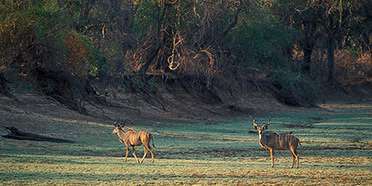 Well off the beaten track in Zambia’s far southwest, Sioma Ngwezi National Park receives minimal protection and practically no visitors. There are no roads or facilities in the park, apart from rough tracks and sites suitable only for the wildest of wild camping. You can see elephants here, however, along with zebras, wildebeest and a good variety of antelopes. If tourism to the Zambezi Region continues to gather pace, efforts may be made to improve things here, as well.